Air tightness plays an essential role in acoustic insulation. Whenever there is air leakage present, there will also be an acoustic leak. That's why Global Homez in association with LUXUS FAÇADE equips all its windows and doors with an acoustic sealing that guarantees the airtightness of the systems, in combination with the central sealing. This acoustic gasket performs best in combination with hidden accessories, as the gasket can continuously be applied on the inside. Another important factor is the choice of acoustic glazing. Asymmetric double glazing (different glass thickness for the in-and outside) helps a lot in keeping out the noise. If you wish to go even further, you can choose for a layered inner glass pane, blocking out even more sound. Top acoustic performance, however, is achieved by investing in a layered inner glass pane, equipped with an acoustic PVB-foil. The perimeter hardware with multiple point locking gets attached to this supporting structure. This can come in various types: oak, cherry, ash, maple and tulipwood. to avoid damage, swelling and the creation of fungi, protective surface treatments are performed on wood surfaces. They optimize the wood/aluminum combination because, by preventing any point of contact between the two frames, they allow for the independent expansion of the two materials. This contributes to the wood frame insulation, preventing it from being stressed by external pressure. there are two types of glazing beads used in the LF Alu-wood systems: clamp-on and snap-in. Clamp-on glazing beads are used in systems with a single panel frame and are made out of insulating material. The snap-in type are in aluminum and are used in systems with single panel frames and glazing bead; in this case, the assembly between the aluminum glazing bead and the wood frame is always done using nylon parts. Due to their quick application, glass installation is extremely simplified. The LF Alu-wood system gaskets are mostly made of Epdm and tpE. the first material has excellent resistance to solar rays and can be used from -30 to 130 °C. tpE has a wider application range than Epdm (from -62 to +135°C) and lower conductivity. The large dimensions and tilt facilitate water drainage through special drainage areas on the fixed frame. 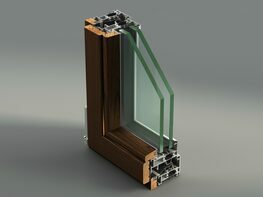 Similar slits are made on the movable frame to allow for normal ventilation of the glass. The water which seeps in automaticaly drains out of the window. The thermal insulation coefficient goes up to 0.9 W/m²K. LF Alu-Wood doors and windows are a real barrier against sound and extreme temperatures. The sturdiness of the structure to which the mounting is fixed, the quality of the materials used and the assembly technology do not require any maintenance at all. LF windows are designed and manufactured so that the properties stay the same over time, also thanks to the designated cleaning kit. The strength of the aluminium frame and the perimeter hardware is guaranteed. Since it is equipped with multiple locking points, it guarantees greater resistance against intrusion attempts. The exterior is aluminium with increased mechanical resistance that remains unchanged by atmospheric agents, while the interior is in wood with its high aesthetic value and warmth. With a wide range of frames and finishes, our doors and windows can be adapted to the most various styles. The result is a product that creates a perfect synergy between functionality and design. LF Alu-Wood systems are EC and UNI certified to ensure the quality and conformity of the products with EU directives. LF Alu-Wood is UNI EN ISO 9001 (Quality System) and UNI EN ISO 14001 (Environmental Management System) certified. For 6+ years, LUXUS FACADE has stood by its customers through all the production, installation and post-sales phases of its doors and windows.